Someone is dancing on the snow !! Choreographed for Skidancing on the slope. One day in the winter of 1965, with a completely blue sky above, I was at the center of a wide stretch of shiny snow in the forest. All of a sudden, I was moved to dance. Spontaneously my body started to dance, but I fell down immediately. 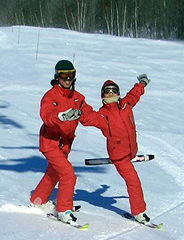 I was an intermediate level skier at that time. "Why, can't I dance on the snow?" That was the very beginning of my long journey in search of dancing on the snow. In 1975, I met a man, Mr. Iwao Takahashi, who had invented a mini ski and tried to develop a new style of skiing. We had worked together for 13 years. I finally reached the conclusion that Figure Skating or Ice Dancing might be the nearest sports to what I aimed to develop.So I started to learn Figure Skating and also Ice Dancing, tackling with snow slope. It was far difficult than had been imagined. ◎The Development of Skidancing and the Concept of our method"
In 1988, I finally succeeded to get almost all of the theories of skating on the snow. 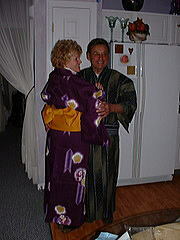 the Skidancing Association of Japan in my name. In 2001, I knew Ms. Cheryl Malffetti through the Internet by chance. They're also using 80 cm blades and aiming to dance on the snow. They invited us to the USA. 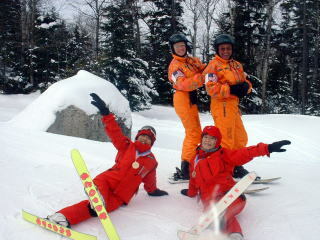 We had International Ski Dancing Festival in 2003 and 2005 in Bretton Woods, USA. We exchanged many ideas and worked together.Our techniques are admired as the number one in the world. *e-mail address *TEL *your boots size. 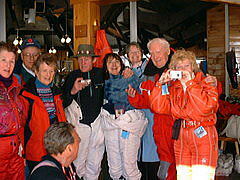 Application for ski tour: write tour number, the date, number of people. copyright©2015 Ski Dance Association of Japan all rights reserved.